When speaking about roller rocker systems, there are typically two main categories that they fall into; shaft mount and stud mount rockers. It seems there is a large misunderstanding of when a shaft mount rocker system is truly necessary. One of the largest differences that most enthusiasts notice between the two types boils down to cost, shaft mounted rockers are primarily more expensive because of the cost involved to manufacture and the complexity of the systems. Within the two groups of rocker arms, there are several variations within each group. Depending on the level of the application; the rocker arms can have roller tips, or roller trunnions, and even both roller tips and trunnions. The latter is the most efficient and durable solution, but also the most costly option out of the bunch. Most factory applications, like the LS factory rockers, have a roller trunnion and are cast or they are production stamped steel. Theoretically, having either a roller tip or a roller trunnion, or both, reduces the engines’ frictional forces and free up horsepower congruently. Variables that would warrant the upgrade stud mounted rocker setup could be opening spring pressure or when solutions are needed for high RPM operations. Shaft mount rockers require a more involved installation, but the reward is advantageous for most high horsepower applications. 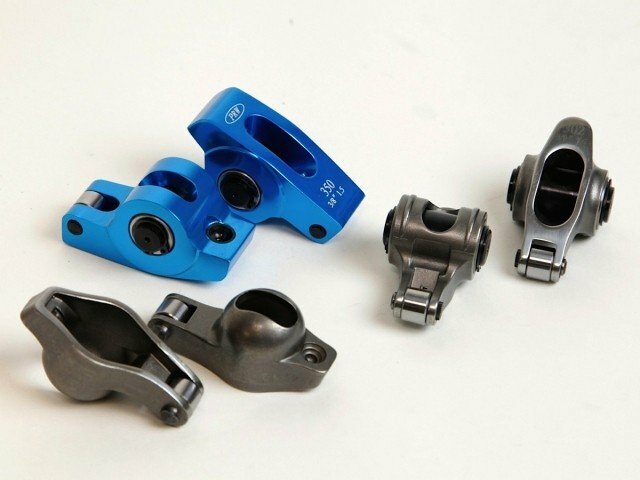 There are four basic types of shaft mounted rocker arm systems. 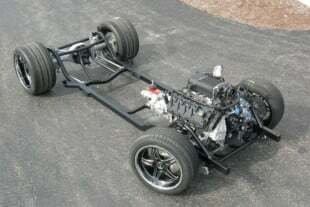 The first utilizes a pair of trunnion rocker arms that pivot on their own stand, with a set per each cylinder. With the paired trunnion rockers, it’s possible to have one complete stand per bank of cylinders. Occasionally paired trunnion rockers will bolt directly to stock pedestals, these kits generally cost less. The third type of shaft rocker utilizes an individual mounting stand for a single rocker. The fourth type employs a shaft for an entire bank of cylinders, or in some applications two shafts per bank. Shaft mounted rockers have multiple advantages over the stud mount setups. Since the rockers are mounted on a stationary shaft they do not twist and the trunnion does not move up, or down like when lash is experienced on a stud mounted rocker. Shaft mounted setups eliminate erratic valve opening motions because the trunnion always remains stationary. Another benefit is that the pushrod and roller tip can be offset to accommodate larger intake ports. Having all the rockers tied to a single stand that stretches the entire bank will increase torsional rigidity as well. So when it comes to choosing a rocker assembly it’s not always best to just upgrade to a shaft mounted setup, because it may be overkilll. A stud mount system may save money, but in the long run may not produce the best results in a racing application. Determining the correct material and type of rocker system for the application, will save money or future headaches.